by Shusta, Robert M., Levine, Deena R., Wong, Herbert Z.
Shusta, Robert M., Levine, Deena R., Wong, Herbert Z. Fourth Edition MULTICULTURAL LAW ENFORCEMENT Strategies for Peacekeeping in a Diverse Society Robert M. Shusta, Deena R. Levine, Herbert Z. Wong, Aaron T. Olson and Philip R. Harris "The authors of Multicultural Law Enforcement: Strategies for Peacekeeping in a Diverse Society illustrate that an awakening must take placeiflaw enforcement is to adjust successfully to the demographic realities facing theUnited Statesin the 21st century. This text shows why an enhanced sense of cultural awareness and understanding of multicultural diversity issues have become increasingly essential for today's police officers." Retired Captain Alan C. Youngs, Lakewood Police Department (Colorado) The five authors ofMulticultural Law Enforcementprovide a comprehensive look at the challenges that police officers face as they interact with individuals from diverse ethnic and cultural backgrounds. The authors focus on cross-cultural contact with law enforcement and the associated professionalism required to deal with issues of multicultural diversity. They highlight the fact that, with the respect that law enforcement exhibits, members of minority communities and law enforcement will develop excellent relationships and mutual trust. . 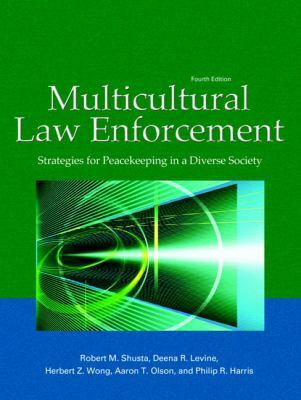 This completely updated Fourth Edition ofMulticultural Law Enforcement: Strategies for Peacekeeping in a Diverse Societyprovides key insights and information relevant to criminal justice professionals on law enforcement contacts across cultures and races. Chief executives, managers, supervisors, police and correctional officers, federal agents, and students will all benefit from the book's guidelines, its insights and the practical knowledge in every chapter. . This fourth edition includes new or updated information on: Community policing - new success stories and illustrations. Immigration and unauthorized migrants in the U.S. Racial profiling status and new legislation Recruitment and retention of women and minorities Issues pertinent to sexual orientation and law enforcement Native American tribal police and issues of identity Multicultural issues related to terrorism, homeland security, and disaster preparedness. The "Patriot Act" and related issues for law enforcement. Effective response strategies to reduce hate and bias crimes; post 9/11 updateShusta, Robert M. is the author of 'Multicultural Law Enforcement Strategies for Peacekeeping in a Diverse Society', published 2007 under ISBN 9780131571310 and ISBN 0131571311.